Imagine…a world class magician and illusionist performing to a sold out small crowd. No strings, no fog, no mirrors, and no trick lighting. Just you, about 49 others in a small venue trying to figure out what just happened. 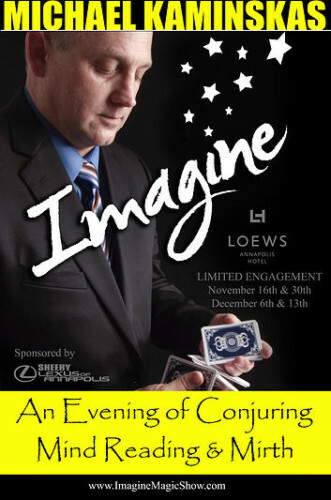 Imagine, the show by Maryland illusionist Michael Kaminskas will be wrapping up a very limited engagement at the Loews Annapolis Hotel for the next two Thursdays–December 6th and 13th. The show, approximately 90 minutes with a brief intermission, will amaze you with card tricks, rope tricks, and sheer mentalism. During 19th century Europe it was commonplace for guests to be entertained in the close quarters of a parlor or salon. With seating for just fifty guests, Mr. Kaminskas recreates the intimacy of these engagements ensuring that every seat is literally the ‘best seat in the house’. We can’t spoil the show by telling you exactly what the night has in store. However, after spending an evening witnessing Michael’s contemporary magical artistry even the biggest skeptics will rethink what is actually possible in a world not bound by the limitations of reality. The show is sponsored by Sheehy Lexus of Annapolis and is presented in the Power House at the Loews Annapolis Hotel. Tickets are still available and can be purchased here. Ticket price includes a free drink (cash bar after that), a 10% discount at WEST, and discounted parking if needed.